PHUKET TOWN: Four-hundred motorcycle riders turned out today to exchange their substandard headgear for free safety helmets of life-saving quality. 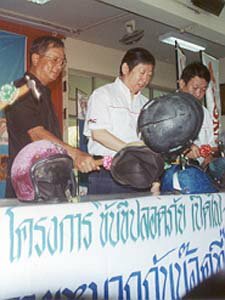 In a ceremony at Phuket Town Provincial Hall, officials used hammers to crack some of the old helmets as a way of demonstrating their ineffectiveness. The safe-riding campaign, which urges motorcyclists to use quality helmets and to ride with headlamps on during the daytime, was organized by the Thai Motorcycle Enterprise Association, local officials, and Honda dealers in Phuket, which paid for the new helmets. Information on the road safety campaign has been sent to various government offices, to schools and colleges, and to motorcycle dealers, and is backed up with T-shirts printed with safety slogans. The safe-riding campaign is to be repeated in other provinces; next in line is Surat Thani.